After being recognized in FORBES Magazine as a “triumphant success” in green design and technology, the City of Pittsburgh is finding ways to celebrate the city’s innovations in sustainability. Acrobatique Creative, working with the City of Pittsburgh and key partners, has developed an initiative open to all in the region who want to celebrate a resilient city and a more sustainable Pittsburgh. Pittsburgh Earth Day is a citywide celebration of advancements made in sustainability, technology, and innovation where people live, work, and play. The annual kickoff will begin on April 18th, 2019 with exciting activities held at the Fairmont Pittsburgh, Market Square, and much more. Stay tuned for exciting updates! Back in the early 1980s, when Pittsburgh lost 120,000 jobs from the steel industry in a very short period of time, the region faced a crisis. Businesses, civic leaders, and residents had no choice but to go through an intense period of hardship and self-reflection. This dark period had a silver lining; it brought people together and spurred creative thinking and resiliency. Pittsburghers rolled up their sleeves and set out on a new course. Over the last three decades, the region’s economic transformation and growth has been nothing short of jaw dropping. And the change has been recognized internationally. The zenith of this recognition may have come in 2009 when Pittsburgh’s transformation was acknowledged by President Barack Obama. The President picked Pittsburgh as the host city of the Group of 20 Summit. He declared that the city was fully part of a new global, ecological economy. In June of that year, the world turned its eyes on the world’s leaders deliberating in a city rebuilding with muscles and brains. Ranks 8th in the nation in number of LEED-certified buildings. Revitalizes riverfronts with a growing number of walkable and bikable spaces. Moves to more complete streets with continuous bike-pedestrian connections. Boasts a 408% increase in bike commuting since 2000, the largest jump of any city in the nation. Relies on over 50 organizations performing climate actions. Offers cleaner rivers and fights for clean air. Five years ago, Pittsburgh was ranked the fifth Most Resilient City in the World, beating out cities like Stockholm. The London-based Grosvenor Group acknowledged the region’s moxie developed from the collapse of the steel industry and how it forged a community ready to deal with adversity. If Pittsburgh can bounce back from a major decline in manufacturing, it is poised to deal with other crises including those posed by climate change. Earth Day 2019 is the year in which economic growth and sustainability join hands. Celebrations are planned around the world. Can anyone think of a better place to be than in Pittsburgh? Keep posted for our video “From Steel to Sustainable” coming soon! In 1969, Earth Day founder Gaylord Nelson, then a U.S. Senator from Wisconsin, proposed the first nationwide Earth Day to help put environmental issues onto the national agenda. A year later, on April 22, 1970, the first Earth Day was celebrated throughout the country. An estimated 20 million Americans participated in events calling for a healthy, sustainable environment. Earth Day is now celebrated each year on April 22nd and held worldwide, demonstrating global support for environmental protection. Throughout the years, area residents have celebrated Earth Day in the towns and municipalities they call home. From the Pittsburgh Zoo to Ellwood City to Mt. Lebanon, dedicated citizens have worked to promote what is healthier and more sustainable about the community they love. Earth Day has been powered by Pittsburghers, going back to the early 1970s. On Thursday, April 18th, 2019, we are kicking off a three-day event with the objective to grow the celebration with year-round programming. Earth Day 2019 features events such as the Ecolution Fashion Show, Business Breakfast, Great Lakes Sustainable Bar Crawl and Earth to Table. We will also have exhibitors, pop-up markets, speakers, music, food, and much more. We want to make it a recognized event for future years similar to the Three Rivers Arts Festival, Pittsburgh Marathon, and Light Up Night. We invite you to make history and be a part of this inclusive Earth Day. Help move us all toward a cleaner, healthier, and more sustainable Pittsburgh. 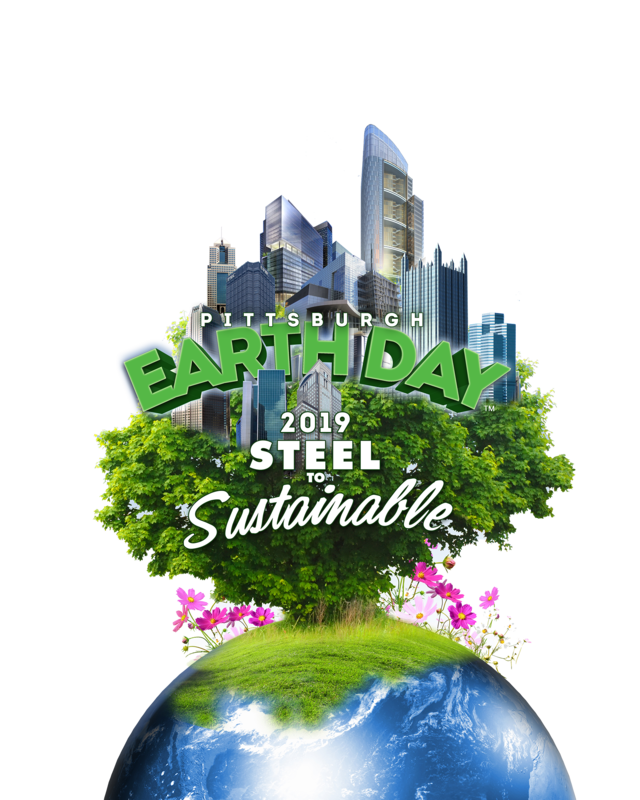 Acrobatique Creative, Ltd. is authorized license-holder by the City of Pittsburgh for Pittsburgh Earth Day™ on April 19th and April 20th, 2019, and is owner of a variety of brands related to the event. If you are a vendor and you are interested in manufacturing, selling or otherwise distributing Officially Licensed Pittsburgh Earth Day™ merchandise using any of the Official Pittsburgh Earth Day Brands, please complete the form below to obtain licensing fees and quality-control information. Any obligations to Acrobatique regarding permissions to use brands are in addition to any other vendor licenses or other obligations that vendors may have, such as to the City of Pittsburgh for vendor solicitation licenses. Acrobatique offers a wide variety of services, including streaming of video material on the internet featuring historical and other content regarding the steel, oil and gas industries, conservation, environmental, sustainability, earth-aware and green programs; educational programs including seminars, classes and workshops; arranging and conducting special events for social entertainment purposes, speaker panels, classes regarding economic and historical issues, economic revitalization, steel, oil and gas industries, conservation, environmental, sustainability, earth-aware and green programs; special event planning services for social entertainment purposes; entertainment exhibitions in the nature conservation, environmental, sustainability, earth-aware and green events; entertainment and conservation, environmental, sustainability, earth-aware and green events for cultural or entertainment purposes; community also providing food, art and exhibitions.